Happy Tuesday, everyone!! And Happy August! Where has the summer gone?! Seriously, I can’t believe July is already over! Here’s a look back at an outfit I wore a couple weeks ago (you might remember seeing it on my Instagram). Nearly every item I’m wearing head-to-toe is from the Nordstrom Anniversary Sale!!!! This basic black tee has been on repeat lately (I bought it in white too. 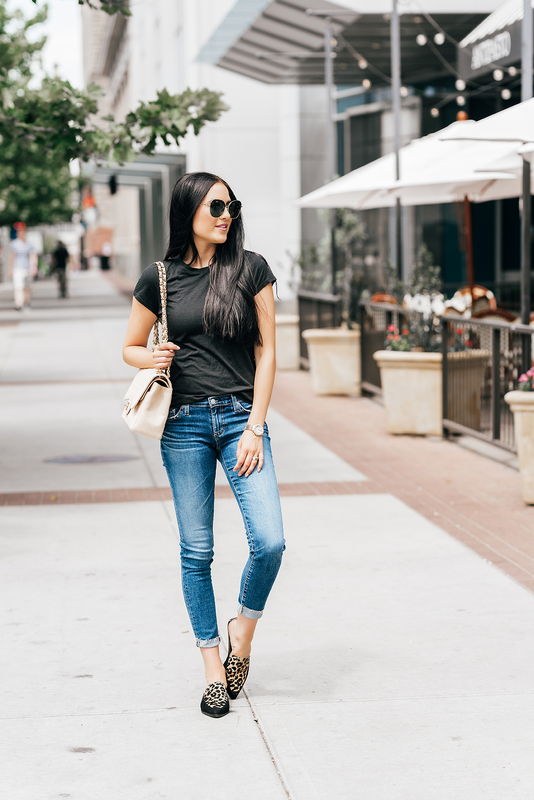 Last worn in this post) and you’ve seen me wear these jeans and these flats before – both are two of my favorites from the sale! Thanks so much for stopping by!! I hope you all have a wonderful day! Laid back look pulled off nicely. I love a good hint of leopard. It can be so classy when done right. Love this outfit! You’ve been killing it lately with styling basic pieces! That means so much!! Thanks Rach! Those AG jeans are so gorgeous they look so comfy!! These are the cutest flats!!!!! So basic, yet so chic! Love the mules! I’m so pumped with fall approaching, more leopard will be popping out in my wardrobe! 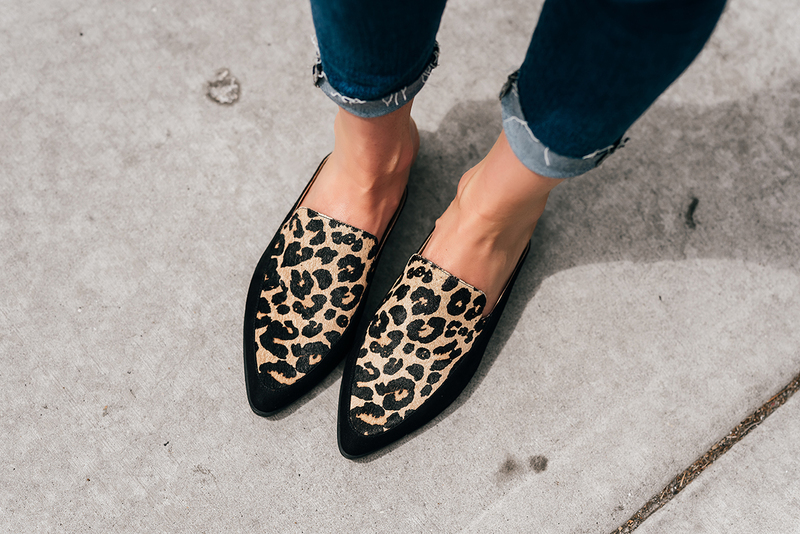 I love pairing my leopard shoes with just jeans and a black tee too. It looks so freaking chic! Me too!!! Thanks so much Mollie! Loving those mules! You styled it perfectly, I want to buy a pair! Thanks Nicolette!! You need a pair! It’s one of my favorite trends right now! Great casual combo, I like your shoes and sunnies! You look soooo chic! I love this look. It seems super effortless, but still so put together. Love, love and love! I LOVE a good pop of leopard print. I don’t do prints that often but when I do, gotta love me a good leopard print! hi! love the outfit, but I don’t think that t-shirt link is the one you are wearing.. looks like you tagged a v-neck while you’re wearing a crew. may want to update the link I’d love to purchase the crew neck tee! GIRL, I am always impressed by how good you look! The fact that you have 2 little ones is beyond me. Would LOVE a lifestyle post, on your typical day… how long it takes you to do your hair/makeup, what your day looks like form start to finish, how you fit it all in, and if you ever watch TV! Seriously, you are inspiring to me when I have my own family one day!! Cute outfit, I love pieces that are versatile! Everything should be mix & match! love seeing simple looks like this! Love those flats! Such a casual yet chic outfit. Such a cute and simple outfit and I’m so in love with your shoes! Love the Nordstrom Anniversary Sale, its my fav! Along with that those leopard slip ons are so chic! Such a cute casual look! Love the leopard print! A pop of leopard is perfect for any occasion! I love the slides here! Love how casual yet effortless this outfit is! Those loafers definitely make an awesome statement! So cute. And Nordstrom Sale for the win everytime!